Here is a photo of a Taize service…..I finally remembered that i had found information about Taize on the Lighthouse Trails Research website. Taize is a prime example of how contemplative spirituality is compromising the church. It appeals to the youth and is Buddist oriented with a Catholic flavoring. Taize Community is an international, ecumenical communityin France. Taize Worship is practicing the silence with icons, candles, incense and prayer stations, and is a very contemplative/Buddist oriented community attracting young people from around the world. Short chants, repeated again and again, give it a meditative character,” the brothers explain in a brief introduction printed in the paperback songbook. “Using just a few words, [the chants] express a basic reality of faith, quickly grasped by the mind. As the words are sung over many times, this reality gradually penetrates the whole being. While it is apparent that Taize is rooted in Eastern mysticism, it is equally apparent that it is being incorporated more and more into Christendom. Below are some examples of Christian ministries and schools that are introducing people to Taize worship. Hi, just surfing through on a Friday night. I really like the new look of your blog! This latest info is interesting. I have to admit I know next to nothing about the Taize community in France. I only know how Taize is practiced locally, and the local Lutherans do nothing like what’s pictured or described above! Maybe it has gone through some changes on its way across the Atlantic? I checked out the website you were talking about too. One thing I’m really confused on: how do they define “contemplative”? I was really surprised at some of the things and people on their list. It almost seems like any ideas or experiences that can’t be defined rationally fall into the contemplative category……? Dallas Willard – contemplative. I’ve read “The Divine Conspiracy”. Lots of good things to say if you take it with a grain of salt. Alpha Course – not contemplative. Too evangelical/charismatic to fit the description. The Alpha Course (I helped lead one this past spring) is basically a combination evangelistic outreach & church growth tool. Julian of Norwich – CLASSIC contemplative. Another set of writings where there’s great stuff in it but take a fair number of grains of salt with you. Henri Nouwen – traditional Catholic contemplative and scholar, nothing radical about him. Agree with some of his stuff, disagree with other stuff. Well i believe that there is hardly any difference between contemplative and meditative. Pretty much interchangeable. Contemplative spirituality is a deceptive term that will invite Christians into a practice that is really eastern mysticism. I don’t know much about Dallas Willard, and the Alpha Course? i know about the Alpha State which is allowing yourself to fall into an altered state of consciousness, necessary for the enlightenment of the NewAge philosophies. That is radical enough for me. The Alpha Course was started by Holy Trinity Brompton in London (an Anglican charismatic church) and has been successful worldwide in bringing people to the faith and into local churches. “Alpha states” are a totally different thing, thank goodness! I had to read Nouwen in a seminary course a couple decades ago. (Haven’t read his stuff since… sorry to hear he ended up in universalism. )The professor wasn’t pushing Nouwen’s teachings… he was exposing us to a number of different approaches to thinking about Christian spirituality, and our job as students was to agree or disagree with the assigned readings and say why. At the time I was doing a good bit of writing in apologetics (very similar to what you’re working on) so I was pretty much on my guard with the stuff. My biggest problem with Nouwen — and many of the other “contemplative” writers — is that a steady diet of it eventually devolves into navel-gazing, or to put it another way, it’s a head trip. Very easy to become self-involved and puffed up with knowledge. My professor told me later Nouwen himself admitted his greatest sin was pride. That said, I still don’t see a problem with contemplation as guided by the Spirit, unless we’re talking about two different things, which is why I was asking for definitions. As I understand it, in the Christian world, they go something like this: meditation = to think about something deeply, to ponder. To meditate on scripture is to “read, mark, and inwardly digest” it. contemplation = similar to meditation but usually includes some kind of revelation from God like a dream, a prophecy, or a teaching. It’s touched with a little bit of mystery, it’s a little beyond the everyday in the same way that miracles are. “Contemplative” writers are people who have experienced these kinds of things. In my understanding the benefits and pitfalls are very similar to the charismatic gifts, in fact (now that the words are all on the screen) the thought occurs: Christian contemplation might be considered a form of the charismatic gifts, maybe? Which, like we said before, can be done scripturally or can be counterfeited. Neither of us is ready to say speaking in tongues is unChristian, even though neither of us does it. I don’t see visions like Julian of Norwich did (!) but I can’t quite write her off as a heretic either. Sorry to be so long-winded! My hope is to encourage you rather than debate… keep on digging, and don’t be afraid to look at the original source materials (that is, the Alpha course itself, or one of Nouwen’s books). God protects those who serve Him, you won’t be misled if you read the sources with the Holy Spirit’s guidance. I like this definition you give…. It is the “method” one uses or promotes, to create their own experience that worries me. It is a step into the occult. Occult is defined as things hidden or secret. Any method used to tap into these resources is divination which is forbidden in the Bible. Biblically, we are to approach God by coming to Him by faith through Jesus Christ. Peg, i appreciate your comments and i always need encouragement. Thank you so much!!! The difference between Christian contemplation and dabbling in the occult is who initiates the process…? In other words, if a Christian in the course of everyday prayer and/or meditation is unexpectedly touched in a special way by God, then that’s from God…….. BUT if a person attempts to manufacture an out-of-the-ordinary spiritual experience, or in some way make it happen, that’s an attempt to force God’s hand, which is a sin (divination? sorcery? maybe both?). Does that sound about right? …and scroll down a little past halfway. There are 6 posts total — “Quiet Day” parts 1, 2, and 3 (notes on the talks) and “Meditations” 1, 2, and 3 (my responses to the lessons). Feel free to ask questions if you like! Yes, this makes sense, although i would like to clarify something. If the Christian tries to manufacture a spiritual experience using occult methods the experience probably will be occult. No matter how beautiful it may seem. That sounds about right to me too. I think it goes without saying that using occult methods is not a good idea, anytime, anywhere, period. All we need now is a definition of what “occult methods” are (keeping in mind sooo much of the occult is a counterfeiting of what’s true and right). I think anyone who practices or promotes contemplative spirituality, whether it be the spiritual disciplines, spiritual direction, or a meditation practice that invovles being very still, breathing excercises, and finding that silent space within…would be classified as a contemplative in my books. Even though i have Roger Oakland on my Blogroll, Understand the Times, i had not read this article. It is very good. I like this comment from Roger because it really sums up Contemplative Spirituality. Interesting… looks like Tony’s gotten into Catholic history & spirituality a bit more since the last time I heard him (about 20 years ago). As a former United Church of Canada pastor, I can attest to some of the kookie feminist sophia stuff happening in the denomination. It has gotten so bad that a bunch of “progressives” walked out of a worship service because there “was too much Lord language”. You are a pariah if you use Father language in prayer at leadership events. I am working on a project to help UCCers to leave for a Christian denomination. If anyone wants to help find examples of United Church of Canada heresy for my UCC Watch section, that would be appreciated. In the past year many conservatives have acknowledged that the battle within the denomination has been lost to the liberals and neo-pagans. Now it is time to help the faithful leave for more faithful pastures. re: “time to help the faithful leave for more faithful pastures” — it would be interesting if all the faithful exiting the various denominations end up in the same pastures…! Hello. I just came across your post and wanted to share my experiences with you. Taize is a wonderful place and there I met evangelicals as well as agnostics. There, there is real dialogue between ALL people – however most people who go there are seeking something – and in Taize they are pointed to Christ. Not everyone believes the same thing, but in the classes (which each person is required to attend) we learned strictly from the Gospels. People pray in silence because with the variety of languages spoken, it would be difficult to comprehend what was being said. Some people pray out loud there. Many people judge the brothers of Taize and their methods because they do not know. I had lunch with the leader of the community and brothers as well as several one-on-one discussions with brothers. They really have no other motive other than reconciliation. I wanted to clarify something else as well. There is no offering taken, nor does the community accept donations (unless you are staying in one of the dormitories – then they ask for a contribution.) They work to provide their income by selling things they make. For me to go and stay there for 2 weeks was only $150 USD – and that was their highest donation for someone from the U.S. – so $75 per week for room, board, meals, and everything else. When I was there, most songs were sung in German, English, and French – because those were the people who were there that week. They select the music based on the people who have made reservations to be there. However, the music – regardless of the language – is all scripture. I am a United Methodist minister and am very conservative. I have a passion for making disciples of Jesus Christ. There will be the first Taize meeting in the United States since 1993 in 2012. It will be in Chicago Memorial Day Weekend. Maybe you could attend. May God bless you and your ministry, Kim. May we all love the Lord our God with all our soul, mind, and strength as we love our neighbor as ourselves.. The purpose of the clergy is indeed to point people to faith in Jesus Christ. John the Baptist perfectly pointed people to Christ by telling them they needed to repent. Which of course means to turn away from sin and false gods, and to turn to Jesus Christ. This means a 180….and this is where discipleship comes in if one wants to make disciples. The Gospel is the good news indeed, and when people realize their sinful condition as Romans 1-3 demonstrates, they actually begin to see the need for a Savior. Jesus told Nicodemus that one has to be born again. This is the transformation that occurs when one truly turns to Jesus and is willing to pick up a cross and die to self. Dying to our own wills and living for Jesus becomes our purpose. In John 14 Jesus says three times that love for Him is demonstrated by obedience to His commands. We will be hated by the world for our truthful testimony about Jesus according to John 15. Is this sounding similar to the “real dialogue” you said was taking place at Taize? Even the very elect will be deceived. Not good to play with fire. Let’s stick to scripture. It is always SAFE to stick with scripture. Jesus is our example. Where, in the scriptures, is there a record of JESUS chanting?? 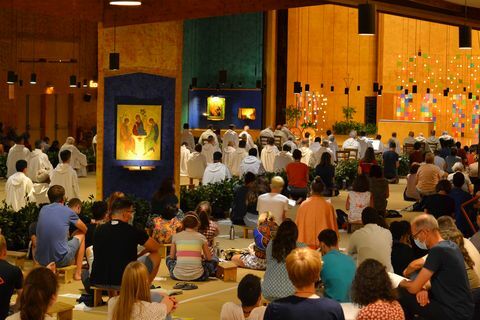 « Crisis in the Church – Taize – What is it?